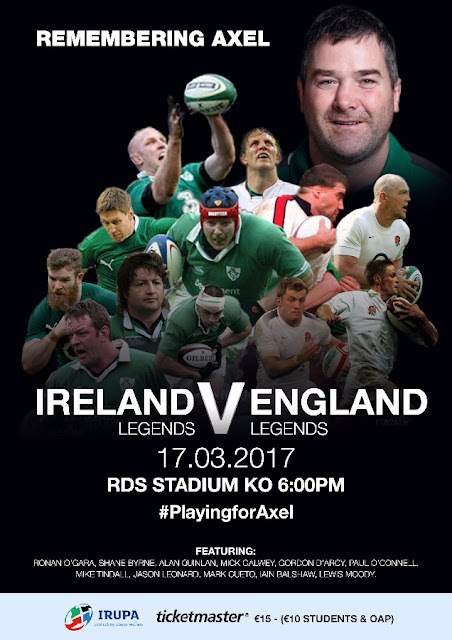 AN IRELAND LEGENDS XV will face England in memory of Anthony Foley in the annual curtain-raiser to the Six Nations clash between the two sides. The exhibition match will take place on Friday, March 17th at the RDS, on the eve of the potential Grand Slam decider between Ireland and England at the Aviva Stadium. This St Patrick’s day will mark the ninth time the sides have met with 2017 promising to be the highest ever profile clash with over 2,300 Test caps on display and household names such as Ronan O’Gara, Gordon D’Arcy, Jerry Flannery, Paddy Wallace and Gavin Duffy to name a few lining out for the home side. The England Legends side, boasting 4 World Cup medals, will feature Mike Tindall, Mark Cueto, Ian Balshaw and Jason Leonard and many more. Both Paul O’Connell and his old rival Lawrence Dallaglio will act as waterboys on the day. It’s not just rugby legends that will take the field as it has been confirmed that all conversions will be taken by celebrities, from all walks of life.